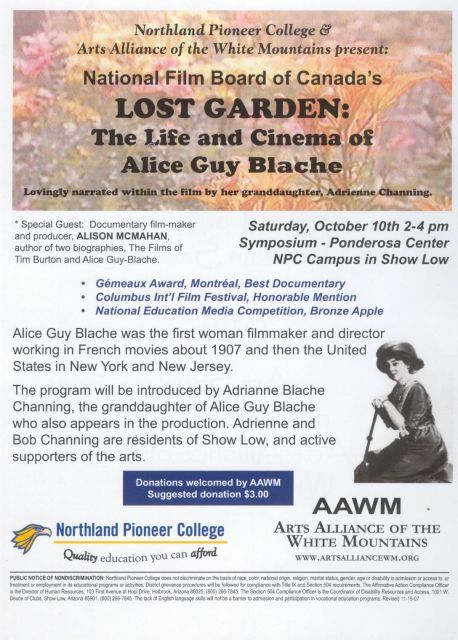 Adrienne Channing, Alice Guy Blaché's grandaughter, and her husband Bob Channing have organized a free screening of the documentary The Lost Garden: The Life and Times of Alice Guy Blaché, (1995, NFB, directed by Marquise Lepage). The screening will be preceeded by music by Steve Taylor and the Mountain Saddle Band and a talk on Alice Guy's life and her Western films by Alison McMahan. Symposium- Ponderosa Center on the Northland Pioneer College in Show Low, Arizona. Organized in cooperation with Northland Pioneer College and the Arts Alliance of the White Mountains.